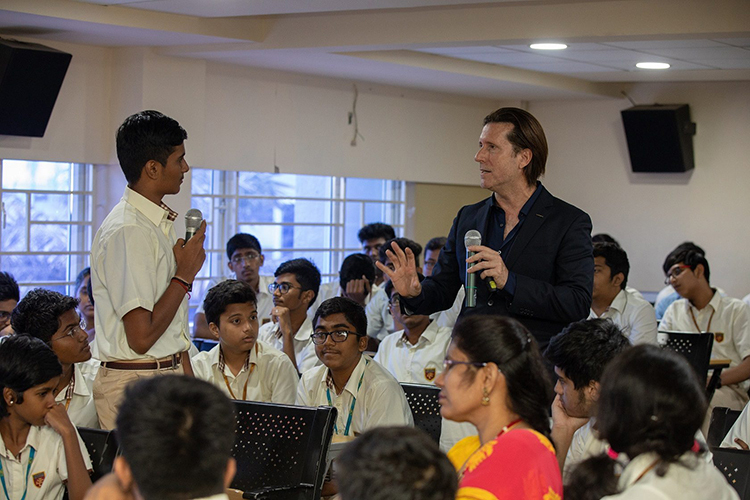 With an objective to encourage children worldwide to explore career opportunities in arts, design and creativity, Alfonso Albaisa, the senior vice president for global design at Nissan Motor Co., launched the “Roots of Design” program in India at Chennai Public School, Anna Nagar Campus in Chennai. After successfully engaging with aspiring students across schools in Dubai, Bangkok, Singapore and Beijing, Nissan is proud to introduce the initiative for the first time in India. Spearheaded by Nissan Design along with Alfonso Albaisa, the program is aimed at inspiring the next generation of creators and developing a different perspective towards design and creativity to solve new problems in the automotive industry. The stimulating session by Alfonso was attended by a packed auditorium of students from Class 11th and 12th at Chennai Public School, their parents and staff members. Albaisa shared the story of his illustrious career with the students, providing them with a first-person example of the exciting opportunities that a career in design can offer. He also gave an overview of the history of automotive design, Nissan’s design philosophy, and the future auto industry trends like artificial intelligence and automation. A report by British Council in partnership with Design Council of India pegged the potential of market for design in India to touch INR 188.32 billion (GBP 1.43 billion) by 2020*. Only about a fifth of this market is currently being tapped. The fact that from a handful in 2010, the number of design institutions has grown to over 70 by 2016 is a testimony to the growing need talent in this industry. Nissan Motor Co., Ltd. Nissan is a global full-line vehicle manufacturer that sells more than 60 models under the Nissan, INFINITI and Datsun brands. In fiscal year 2016, the company sold 5.63 million vehicles globally, generating revenues of 11.72 trillion yen. In fiscal 2017, the company embarked on Nissan M.O.V.E. to 2022, a six-year plan targeting a 30% increase in annualized revenues to 16.5 trillion yen by the end of fiscal 2022, along with cumulative free cash flow of 2.5 trillion yen. As part of Nissan M.O.V.E. to 2022, the company plans to extend its leadership in electric vehicles, symbolized by the world’s best-selling all-electric vehicle in history, the Nissan LEAF. Nissan’s global headquarters in Yokohama, Japan, manages operations in six regions: Asia & Oceania; Africa, the Middle East & India; China; Europe; Latin America; and North America. Nissan has a global workforce of 247,500 and has been partnered with French manufacturer Renault since 1999. In 2016, Nissan acquired a 34% stake in Mitsubishi Motors. Renault-Nissan-Mitsubishi is today the world’s largest automotive partnership, with combined sales of more than 10.6 million vehicles in calendar year 2017.